I'd take photos of something other than sunrises if I was home during more daylight hours. 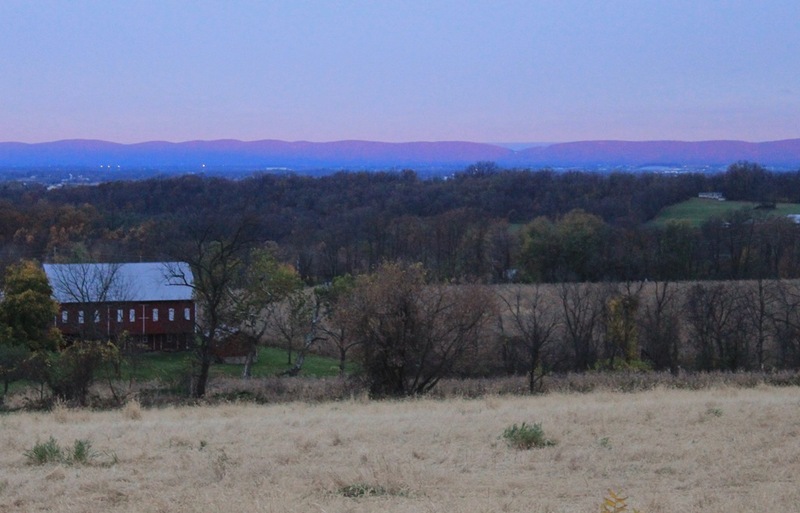 I guess the time of the year has come for me to take all the week's photos for Roundtop Ruminations over the weekends again. As you can likely tell by my photos this week, I resist doing that for as long as I can. A little snow still remains on Roundtop Mtn. This morning it is a bit patchy. I had ice in the chicken water and ice on the front deck that didn't freeze dry overnight. Roundtop ran its snowmaking guns last night. They aren't really making snow for skiing yet. The weekend's forecast for warm weather will prevent them from that. But they did run the guns and check the water lines to make sure all is in readiness. If December's temperatures are normal, they should be snowmaking for real sometime around the middle of the month. I am slowly, perhaps too slowly, settling into my winter-time mode around the cabin. I haven't yet gotten used to bringing in the chickens' water overnight. I switch the water containers in the morning and bring inside the water container frozen from overnight so that it melts during the day. Last night I forgot and had to pour hot water on the waterer to melt the ice and replace the water. I am doing better about bringing the bird seed in overnight so that I'm not awakened at 3 a.m. by the raccoon raiding it. Actually, it's not usually the raccoon that wakes me; it's Baby Dog's frantic barking when the raccoon is on the back deck. In any event, being awakened in the middle of the night gets old fast, so it doesn't take long even for an old brain like mine to remember to bring the seed inside at night. Even as little snow as fell the other night is enough to look for tracks around the cabin. A rabbit that I haven't seen for a while has hopped all around the cabin. Deer tracks follow my tire tracks up the driveway before heading off into the woods. Bird tracks alight near where the snow is especially patchy. I assume they have more luck finding food in those bare patches than looking in or under the snow. The little birds just come to my feeders. They are waiting well before dawn for me to return the feeders to the outside. I carry it out before I or the dogs have eaten. In near darkness, the birds are already waiting, perched on the tree limbs and the deck railing..
I’d almost forgotten the smell of snow in the nighttime forest. It’s crisp, almost tingly, and comfortably moist. Too long it’s been. I’d almost forgotten the silence of a nighttime forest that’s blanketed in new snow. Sounds from nearby seem muted, but distant ones are enhanced. I can hear the train whistle at the crossing seven miles away, but the leaves no longer rustle at a deer’s step or the raccoon’s. Overhead, the sky is still overcast, but the clouds are breaking up into smaller clouds, chunks of gray like rotten ice, with stars shining in between, like water flowing. The full moon shines, hooded and caped by clouds, overshadowed by the expanse of white beneath. Tonight, even the owls are silent. It’s snowing! When I left the cabin this morning, I had little more than a dusting. By noon the snow has stopped, and I’ve gotten an inch or two of wet snow that won’t last very long. Still, this little bit of snow has made me ridiculously happy. Last year snow was virtually non-existent after 10 inches fell on Halloween. I’ve never seen a winter with such a small amount of snow. And the ever-present, looming climate change only made the lack of snow seem as though this area was on the precipice of becoming another Georgia, or at least a Virginia. Neither of those places are much known for winter weather. So along comes 2012 with its blistering hot July, and I was already wondering how far north I’d have to move just to live in weather like it used to be here 20 years ago. I got myself thoroughly worked up about it—leaving family and friends, looking for a new job, leaving my cabin and wondering if I’d ever find another place like it. How would I make new friends where I didn’t know anyone? Yes, I was completely overwrought. But now, it’s November 2012, and the weather this fall has been almost perfectly normal, even a tad on the chilly side. To cap off the month I’m seeing an actual snow and not just snowflakes in the air or a momentary flurry. Ah, this is November the way it’s supposed to be. I guess I can stay here at least another year. Saved by the snow. To November’s subtle charms I would add one more—the leafless trees mean I can now see nests that eluded me during the summer season. I found a songbird’s nest at eye level with my back deck on Saturday. I never knew it was there. 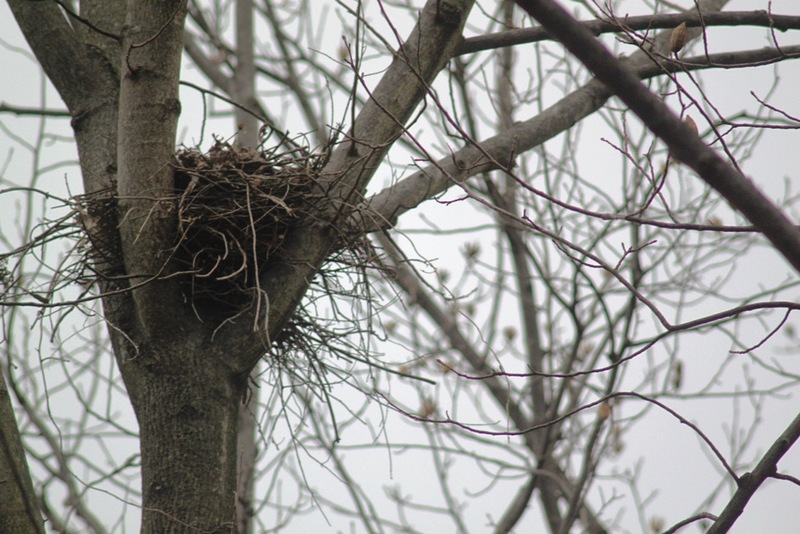 And this weekend I found two more nests—one a squirrel’s nest but the other was for a larger bird, likely a raptor. This last nest particularly intrigues me as it is located in a tree right above the trail that the kids walked up and down every day as they walked from the parking lot to Adventure Camp. That’s about 100 kids up and down the trail all the time and not just in the morning and afternoon. The nest is right near the outhouses, and you know every kid probably used those 3-4 times a day. And whatever nested there simply sat quietly and perhaps raised a family just above all that activity. 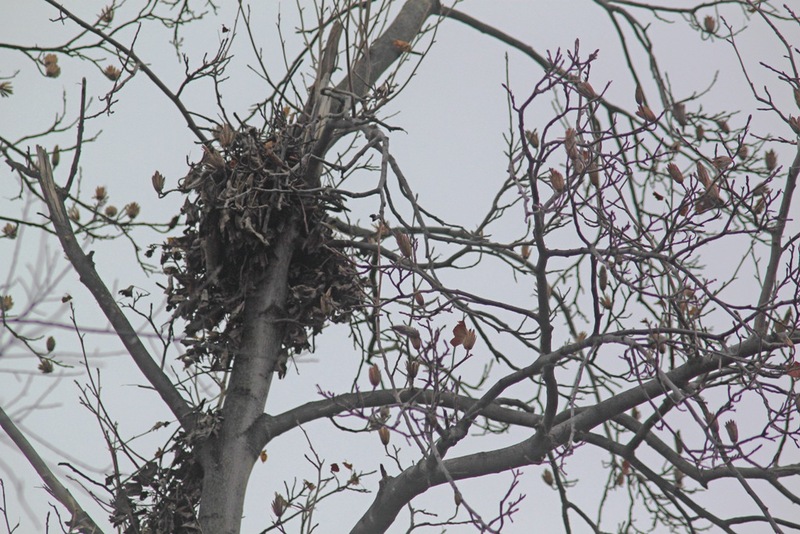 The nest may have been built by a red-tailed hawk or a crow—something fairly large judging by the size of the nest. Raptors tend to build their nests in the center of a tree, as this one is located. You won't find one of their nests out along the outer branches and probably won't find it nearer the top of a tree, either. It’s possible this nest will be used by great horned owls later this winter. A local pair of those are courting near my cabin right now. I hear them duetting nearly every morning before sunrise. This morning they were duetting quite close to the cabin. Judging by the sound, they may have been sitting side by side, as their songs came from the same area. The male calls first and the female answers with a slightly different hooting call. To my ear her notes are the same but somewhat differently-paced and perhaps not quite as loud. Though I have never yet seen it, I’ve read that while duetting the male leans over the female and puffs up his throat so that he looks like he’s swallowed a ball. I tried to find their location this morning in the pre-dawn darkness, Dog in tow, but was unsuccessful. Perhaps tomorrow I will be luckier if the season’s first snow doesn’t keep me from a morning walk. Great horned owls nest in mid-winter and like all owls they never build their own nests. They merely take over one built by someone else. The calling by these two is close enough to the large nest I found this weekend to make me hope they might choose it for their own. If they do, I could at least attempt to keep an eye on it, though as high in the tree as it is, any owlets would have to be pretty large before their ears would peek over the top. Still, it’s worth keeping in mind and worth checking on in January and February, when the owlets would likely be born. I’ll write myself a note on the new year’s calendar so I don’t forget to check. I love how frost looks on the fallen autumn leaves. I love how the frost is sprinkled atop the tiniest bumps of a leaf. I love how the leaves look like sugared doughnuts or a miniaturized landscape after a dusting a snow. I love how the white frost mutes the brown color of the dead leaves. They look almost like a faded red again. 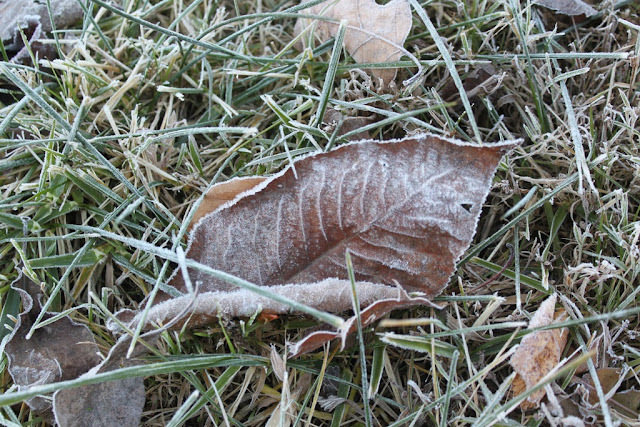 I love how frost enhances the shapes of the grasses or the leaves it touches. 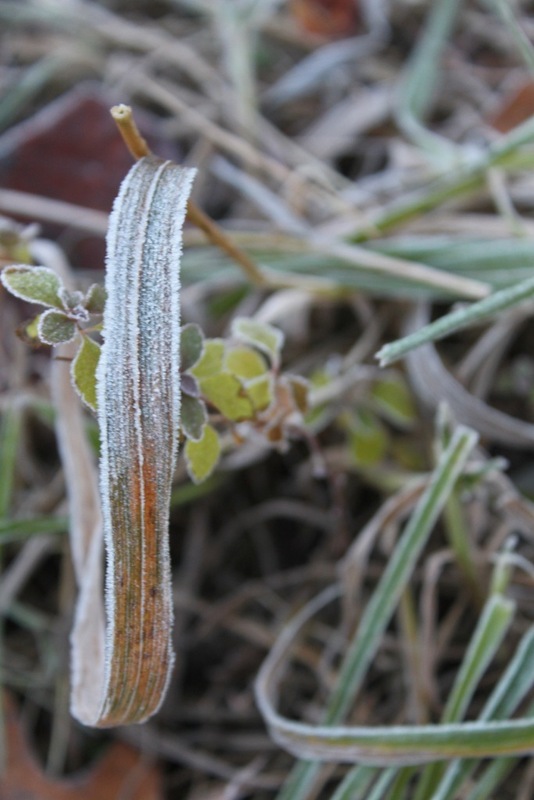 Unlike a freeze that stiffens everything, after a frost the plants are still flexible. 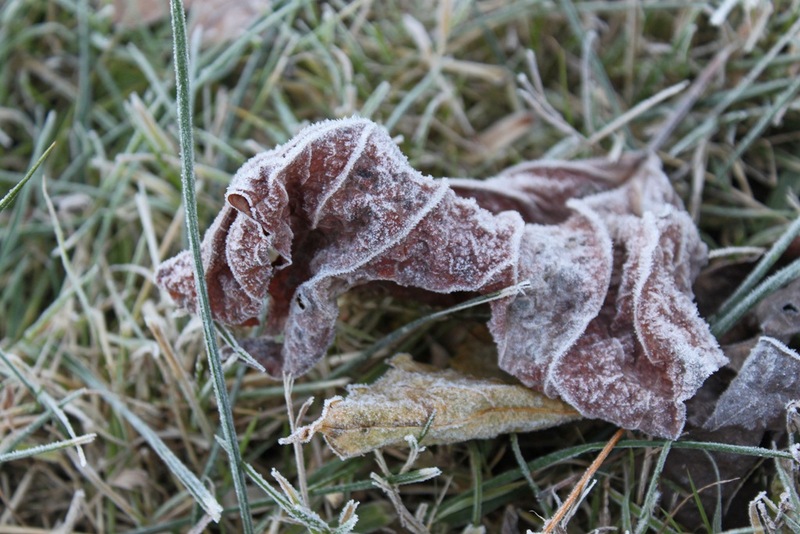 I love to explore the little hills and valleys of a leaf that's touched by frost. I wish it would stay as it is at this moment so I could keep one and look at it every day. But no, the frost disappears with the first beam of sunlight from the new day. Gone. I’ve always found November to be an interesting month. I suspect some of my feeling that way has to do with the sudden openness of the forest after months of living encased in the greenery of the summer. The longer vistas let me see the rise and fall of the terrain, too. Little hillocks or slight depressions are visible again. A tiny draw appears where the landscape appeared to be undifferentiated, and my eye can follow its length down the mountain. Fungus that were there all the time are visible again, too, and looking for their interesting shapes and sizes is one thing I look forward to. Turkey tail fungus is the most prevalent here, though sometimes I suspect my poor identification skills either lets me see those more often or that I am misidentifying some as that when they are really something else that I haven’t learned about yet. The night sky is visible again too, without having to leave the cover of the forest to see it. The stars peek through the skeletons of the sleeping oaks, and the lights from an occasional passing airplane tell me that I’m not really all that far from civilization after all. I love the smell of the late autumn forest. It’s crisp and earthy in air that’s moister than the inside of my cabin. The scent seems almost spicy to my nose, but when I inhale deeply to try and identify it, the aroma skitters away and disappears. Each season has its own scent, and fall’s scent contains a little winter, a bit of summer and something of its own, all mixed together. Raccoon raids are a nightly adventure. Last night one was thwarted by my empty bird feeders, but that didn’t stop it from nosing around looking for something. The prowling threw Baby Dog into a barking frenzy and that woke up Doodle, my rooster, who started to crow at 3 a.m. I was awakened and had to get up, turn on the outside light and prove to Baby Dog that the thief had gone. I could hear it scurrying away through the downed leaves. That’s one thing about November I could do without, though it will be December before the raccoon stops its nightly forays and stays closer to its den. 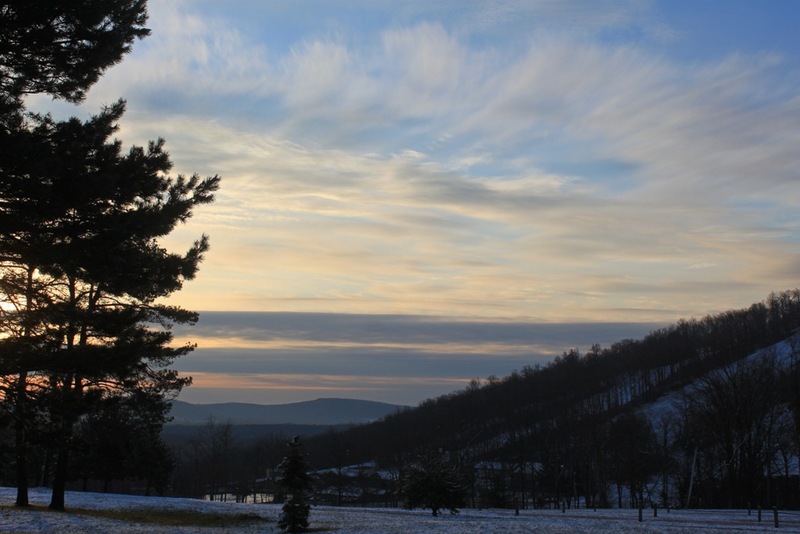 Winter landscape - Nells Hill and Flat Mtn. 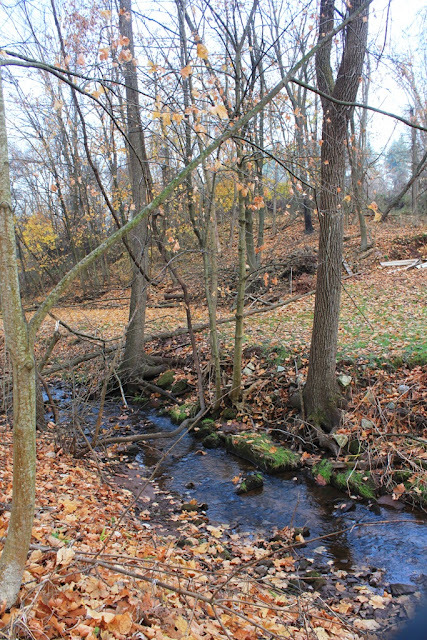 Before I return to normal blogging, I thought I’d present readers with some general impressions so far about my little patch of forest that I’m studying. I still haven’t measured it, as I don’t want the edges of it to be that rigidly defined. I’ve only been looking at this patch for a few weeks now. I started not long before Hurricane Sandy struck, and I can’t always study it every day, though I do try to spend some time looking it over at least three to four days a week. Sometimes even on those days I spend less time there than I’d like. The shortened hours of daylight are partly to blame. It’s not very light when I leave the cabin in the mornings, and it’s within a very few minutes of night when I return. Hurricane Sandy did change how the patch looks. Before Sandy, the leaves that covered the ground were light and buoyant, tossed around with the barest hint of a breeze. After Hurricane Sandy, the leaves were wet and heavy, and several sodden layers thick. The one bare spot was on the opposite side of the patch after Sandy passed through. Over the weeks I’ve noticed a lot more fungus in the patch than I thought was there at first glance. Two of the small branches on the ground came down during 2011’s Halloween snow. I’m sure of that because the branches have been cut with a chain saw, which was only used then. Before that storm, the branches were alive and attached to one tree or another, so the fungus has only been growing on them since “snowtober.” Virtually all the downed branches have at least small spots of fungus on them. 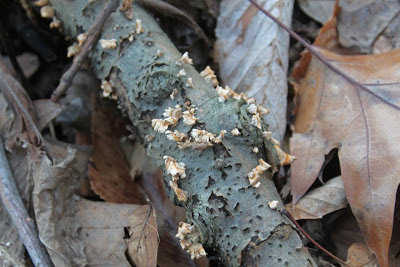 I’ve seen what I think is tiny turkey tail fungus, as well as a nearly pure white parchment-type fungus. I’ve already had a pretty “big” change in the patch. 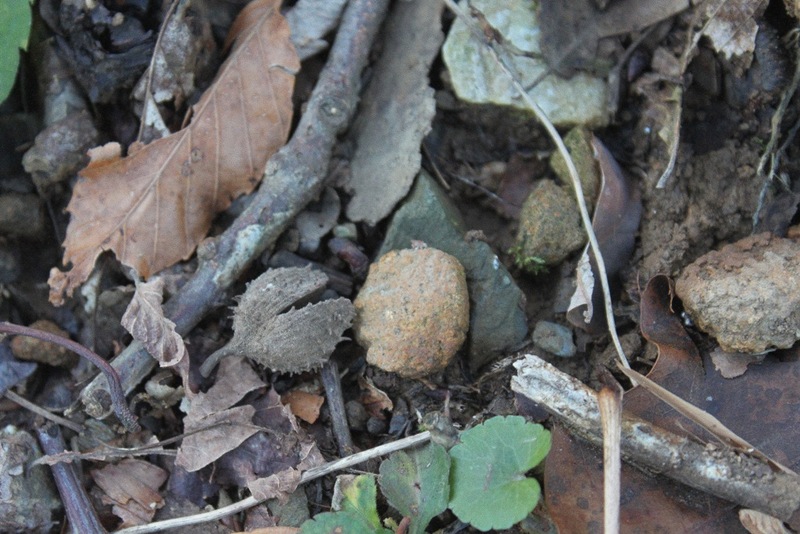 When I first started looking I noticed a nice-looking acorn embedded in the moss, and I had high hopes this acorn might sprout in the spring. There are other acorns in the patch, but they all seemed less likely to sprout. One might be upside down, another looks flat-ish and perhaps malformed, a couple are already rotting. But this one looked promising. Alas, it was not to be. 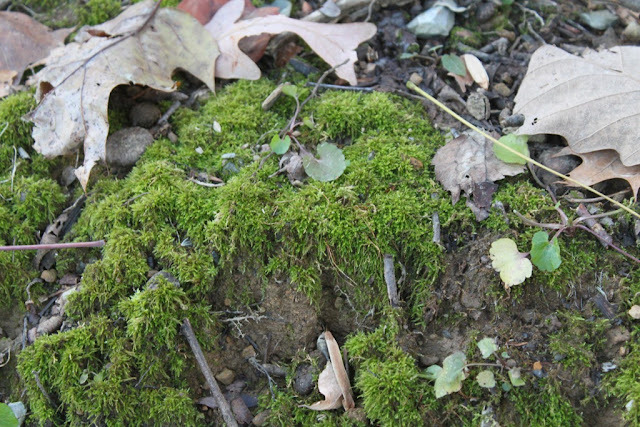 Something, likely a squirrel, dug into the moss and dug it out. I could see the scratch marks in the moss and now there’s a fairly substantial hole where the acorn used to me. I think it’s something of a not-so-minor miracle that any acorns actually get to sprout, let alone grow into the 100+ year old oaks that make up much of my front forest. It’s a long and rough trip from acorn to oak, I am sure of that. Over the winter I have a few plans—identify all the species of tree leaves that are on it, to better identify the fungus, to investigate the rock and the lichens that cover it, and to take look at the seed pods to name a few. 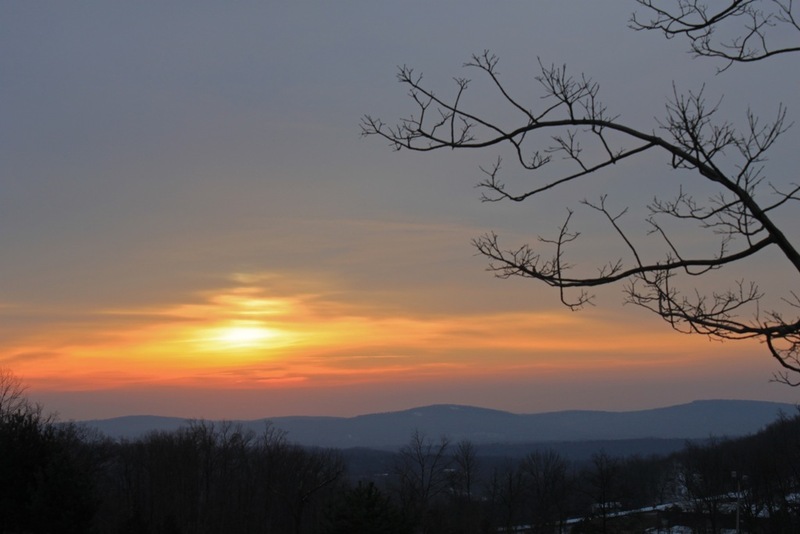 I plan to make semi-regular updates about the patch here on Roundtop Ruminations over the next year. Perhaps once a month, perhaps more often, depending on what is going on. In winter, especially if I get some snow cover, the updates could be less frequent. In spring, certainly, more often is likely. I just hope the patch isn’t too big for me to handle! Winter sunsets are the best. I suppose it's because the air isn't usually hazy the way it often is during the warmer months. This one was especially nice yesterday evening. When I'm driving home from work and can see there's a good sunset coming up, I usually try to reach this spot before I stop and take a photo. Sunsets reflecting in both water and sky are the best of the best. 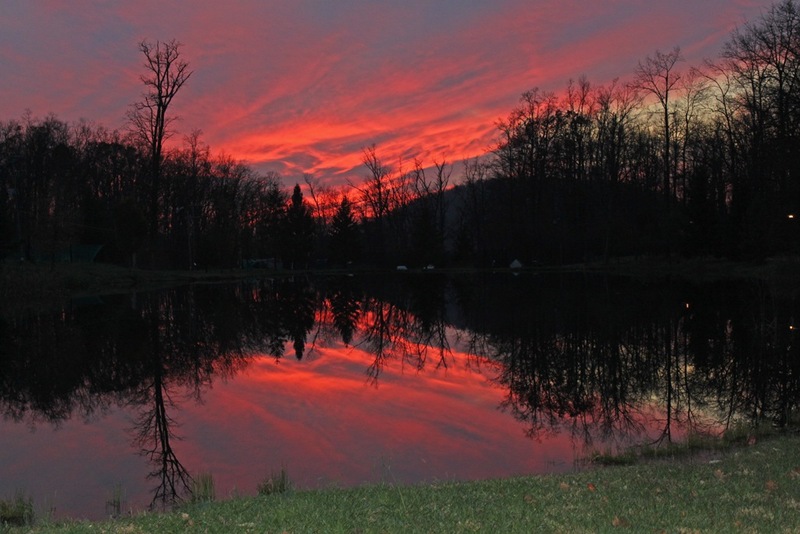 I've tried a few other sunset-over-water spots around my cabin at Roundtop, but I haven't found any that are better than this spot. It has a lot to do with where the sun sets, as well as the water. A larger pond just 100 yards or so away doesn't work as well because the sun sets further towards just one end of the pond, and I've never gotten the full effect of the reflection. At another pond, the mountain you see in the background blocks most of the reflection in the water. The mountain is just too close for that pond. Even this pond only really works well in the autumn and winter after the leaves are down. When the leaves are still on the trees, they block a lot of the effect of a good sunset. It's really the sunset, the water and the open sky that are all needed at just the right time. That doesn't happen all that often, even when you find just the right spot. For some time now, I’ve had the feeling that I am not coming to know the forest around me on a very deep level. Sometimes it’s as though I’m in a car speeding down the freeway while trying to take in the sights of a new area. I see a pileated woodpecker here, find a patch of brown-eyed susans there, notice the interesting color of a sunrise through clouds, but what does that mean, really? The forest is far more than just what catches my eye when I’m in it. To get to more of what a forest is, how it works and what’s there, I decided I need to focus more narrowly on a chunk of it that's small enough for me to keep tabs on, rather than trying to see what goes on everywhere around me. The only way to see more is not to try and see everything as though I’m on some nine-day whirlwind tour of 12 European countries. Better to pick one spot and learn as much about that spot as I can, so at least I can say I know some piece of the forest on an intimate level. But which spot? For a while I thought I could use my front forest, which is about the size of an average front yard. 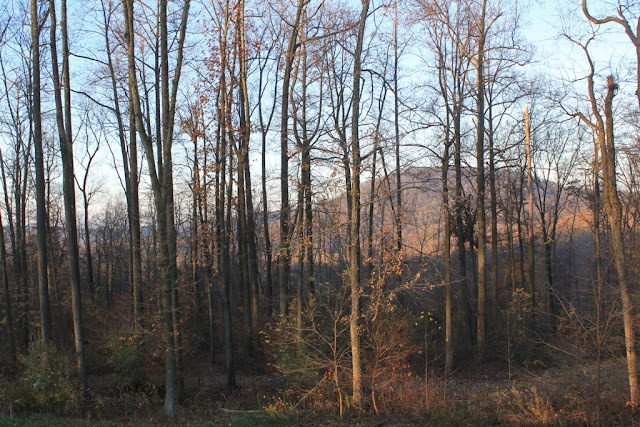 The front forest has a variety of trees, of varying sizes and health. It’s got a busy forest floor, the edges of which bloom with wildflowers in the spring. Birds flit through it, and sometimes deer and the smaller forest animals as well. There must be 50 trees there, of probably a half a dozen or more species. It’s got some rocks and a couple of downed trees that are slowly fading into the forest soil. The smaller plants and seedlings are numerous. Eventually I decided that was too large, too. So for the past several weeks I’ve been focusing in on a smaller patch in my front forest. I haven’t measured it, but it’s about 5 feet by 5 feet. My little patch is nothing special. It’s got a bit of moss, one rock with lichen, a couple of branches with fungus and that’s about it, at least on the surface. The advantage of trying to learn as much as I can about this little piece of forest is that it’s close to the cabin, and I can visit it every day. I can sit there and examine it in all kinds of weather. I hope it’s small enough that I can learn a lot about this little spot, about how the forest works, about how even a patch this small changes over the course of a year. In the course of three weeks I’ve noticed a lot already. It’s amazing how much a small piece of forest can change in just that short amount of time, even during a time when the forest is sort of closing up shop for the winter’s sleep ahead. I have a few rules that I follow when studying my little patch. One is that I can’t move anything. I allow myself to touch things but not to move them. This means there could be a lot going on underneath the fallen leaves that are currently sitting atop much of the patch, but so be it. I expect to use a magnifying glass at some point, but I’m still getting used to the patch itself, so I haven’t done that yet. I have been keeping a journal of my observations, which aren’t always done daily, but are done several times a week. I plan to continue this for at least a year. I’ve always felt that while a year is a nice chunk of time, it’s more interesting to examine how things are the same or different on the same day over multiple years. I don’t know if I can commit to that, though, so for now my goal is to examine this same spot as often as I can for one year. My photos today were taken in my little patch. The spot is nothing special, and in a way that’s part of the attraction. There’s no stream teeming with life or rare plants (that I know of) or anything unusual. It’s just an ordinary patch of forest floor. But I think that’s a pretty special thing in and of itself. I had a bit of sleet at my cabin this morning, as you can see on the roof of my chicken coop. 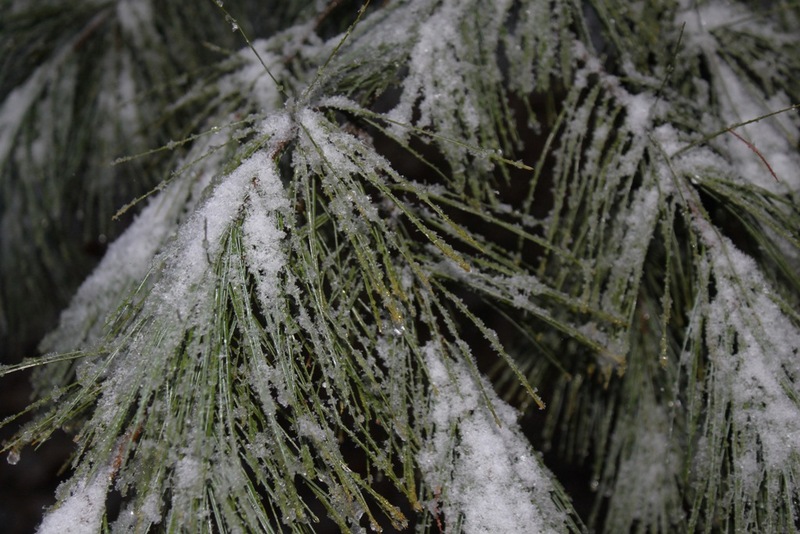 November 13 is not a particularly unusual date for that to happen, though when sleet immediately follows a day when the temperature is above 60, it’s not all that common. The morning started off with rain, which doesn’t deter me from taking Dog and Baby Dog from their morning walks. But shortly after we started I noticed little balls of ice, bouncing like ping pong balls off my rain jacket. Soon the sleet was hitting my face, which stung like miniature bees, and we shortened our walk. Too late, the dogs were already soaked, and my rain jacket was showing its well-worn 15 years by not keeping me dry, either. This morning was winter’s first breath, not a big one, but just enough to tell us it’s on its way. So far, November 2012 is turning out to be below average in temperature, even with the odd 60-degree day from yesterday. After the warmer than usual summer and early fall, it’s a nice break to feel weather the way it’s supposed to be again. Will it last? Probably not. The weekend saw a lot of activity around my cabin—a raccoon was testing the strength of the chicken pen, the foxes were barking at each other nearby the cabin. I kept being awakened by Dog or Baby Dog telling me some predator was nearby. This morning the deer were out in evidence. One galloped right past me and Baby Dog on our early morning walk. I’m blaming it all on a short and warm respite from the blustery and chilly weather. I think I will be glad to have the colder weather return later today. Perhaps I’ll get more sleep. The time of the brown woods of November is here. I don’t mind the pre-winter browns, as a rule. However, I’m vaguely worried that I will be sick of it before the winter snows fall. 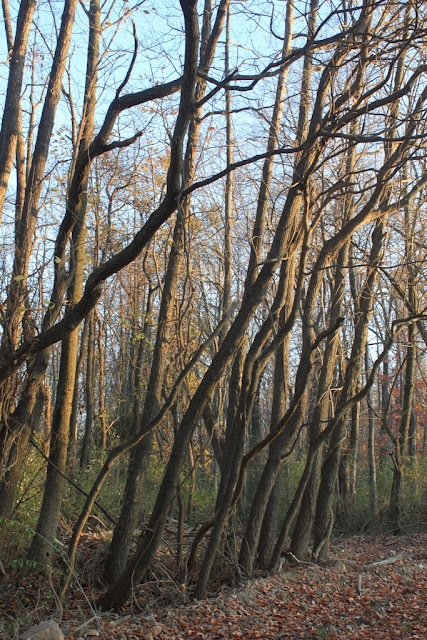 Since Hurricane Sandy shortened fall by forcing all the leaves off the trees, the woods are likely to remain this way for five or six weeks. It’s certainly possible I will see some snow before the end of the year, and in the pre-climate change years of not-that-long-ago, I could pretty much bank on that. But now? And after last year’s utter lack of post-October snow, I am suspicious that the nondescript and non-snowy browns will last and last and maybe even last longer than that. Should that be the case, I will be sick of it by then, whenever “then” turns out to be. In the meantime I am not sick of the November browns, and in fact I’m still enjoying seeing the interesting shapes of tree trunks with the forest in its skeleton mode. 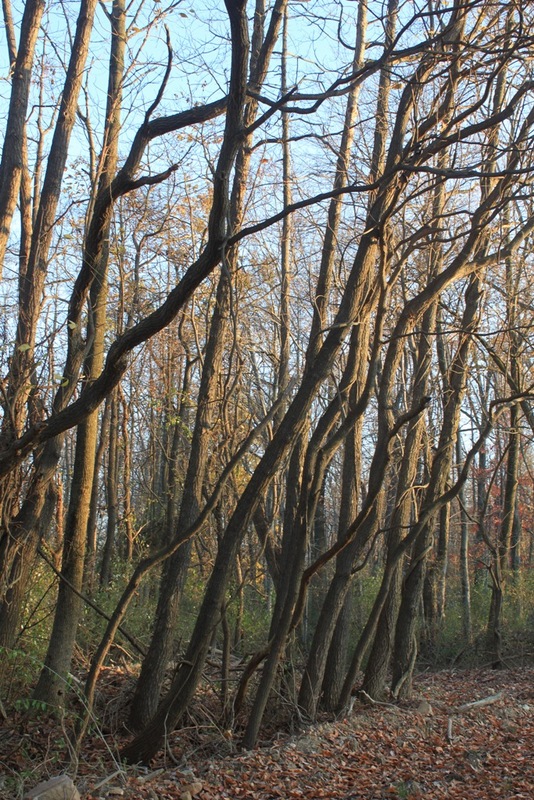 The ones in this photo are mostly locust trees, and they are all bending towards the opening in the forest created by the narrow access road along which they sit. They are all bending to reach as much of the sun’s rays as they can. The trees and their leaning towards the open lane is not new, but when they are all leafed out, the leaning isn’t nearly so noticeable. For me, it’s a case of seeing anew what was there all the time. Maybe that’s part of the reason why I enjoy the pre-snowy, brown days of November. Even the familiar looks different. Just so it doesn’t last all winter. ...for the first time in about three weeks. I didn't realize how much difference last week's time change makes in the morning when the sun rises to a clear sky. Chilly and windy or not, the sun makes the day seem a lot warmer and friendlier. 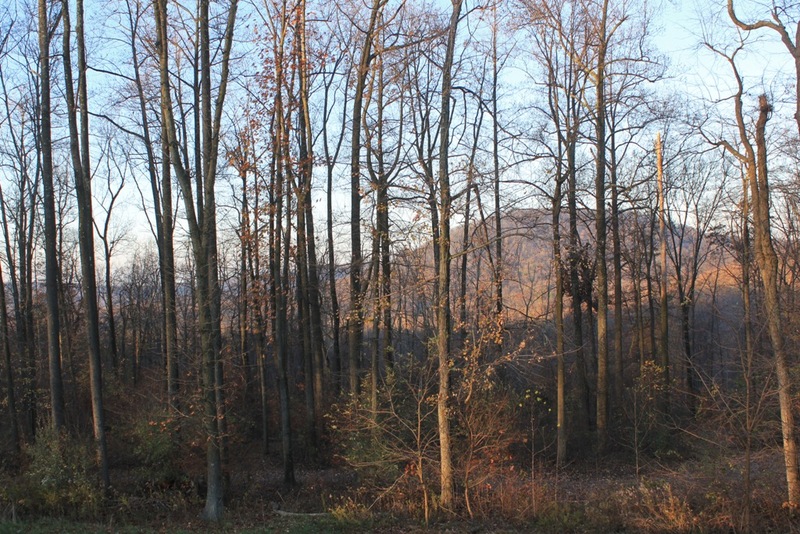 Still, there's no denying the mountains look decidedly wintry these days, even without snow to blanket the forest. 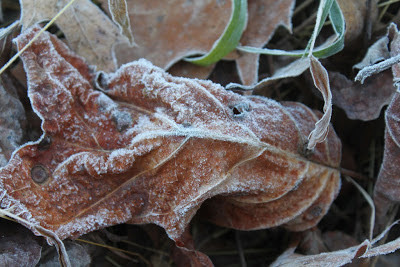 I've had frost, if not always a freeze, each night of the past several. November here is a variable month. Sometimes November is downright harsh, and in other years it's a warm extension of October but without the leaves. This year, as in most, the weather is doing both, often within a few days of each other. Chilly since Hurricane Sandy passed, the next few days will bring warmer, October-like temperatures. That will be a pleasant respite, though of course that won't last either. It doesn't matter. I've always liked weather's variety here. I'm not the sort of person who would do well in a land where the temperature hadly ever changes. I think I'd get bored. Fortunately, living where I do, seasonal variety is the norm. Three weeks of rain and overcast weather was already stretching my limits. I found this tiny bird’s nest this morning right where I photographed it. 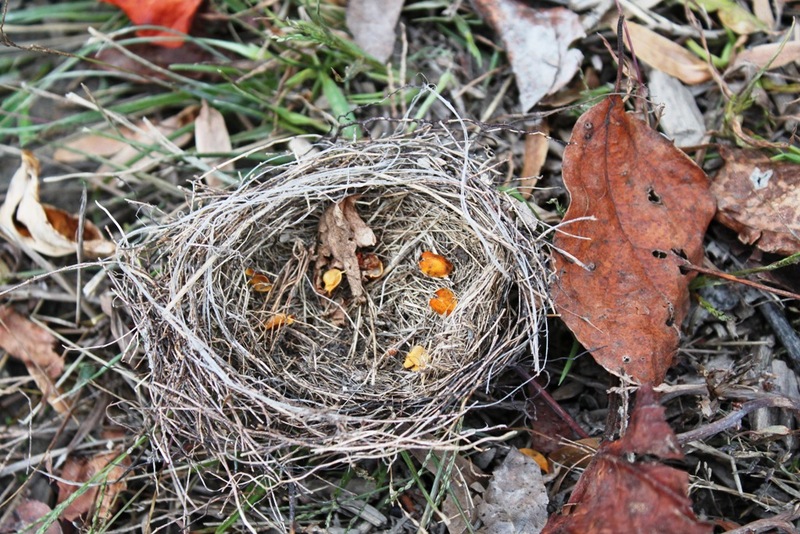 Only perhaps 4 inches across, the nest is made of carefully woven grasses. I imagine that Hurricane Sandy knocked it down from whatever perch it rested on. The orange bittersweet petals were probably not there during nesting season. Bittersweet blooms and turns orange in the fall, so that addition likely happened long after nesting season was over. The grasses don’t appear to be anything unusual, though the top strand is both longer and paler than the rest. I wondered if it was thread or even dental floss, but I haven’t tugged at it to see if it is manmade or not. The size and materials used for this nest are consistent with that of a chipping sparrow’s nest, though of course I will never know for sure. Chipping sparrows are the summer's most common sparrow here on the mountain, and they are known for their flimsy nests. They don’t use mud or any other material as glue. They just weave their grasses, and often the nests are so ill-made you can see right through them. This one appears to be a bit better than average—at least I can’t see through it. The nor’easter that’s currently due to further bother the New Jersey coast and points east later today and tonight is likely going to drop the first inch or several of snow to my mountain. Here I am, still cleaning leaves off my decks and out of my gutters, and now I’ll have to look for the snow shovel, too. I guess climate change is taking a break from all its overheated work of the past few months. 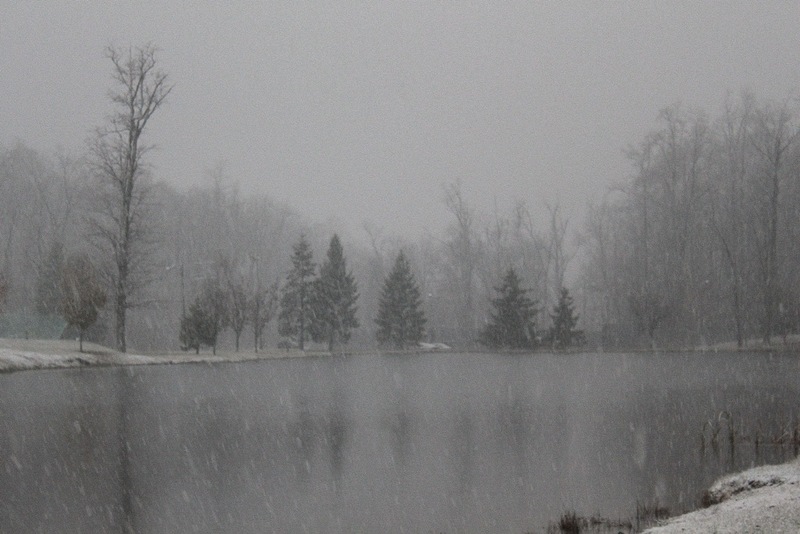 I’m still getting used to the sudden appearance of the early winter landscape around my cabin. Hurricane Sandy was a huge storm, but I still don’t remember any storm that so completely and quickly changed a season from fall to almost-winter. It’s a lot to get used to overnight. This part of Pennsylvania is one where we usually see all four of the seasons. The winters are cold, the summers are hot, fall is gorgeous and spring—well, spring isn’t my favorite, but it’s definitely its own season. The seasons flow from one to the other, and the constant shift is usually subtle. Changes are small, sometimes almost imperceptible, from week to week as one season melds into the next. For me, that’s part of the fun of paying attention to nature, watching how the seasons shift a little bit at a time. Then this year comes along, and the landscape has shifted a whole month, if not more, in the space of a day. The trees are now completely bare, which means I can see distances again. It also means the moon shines into the cabin again, so my bedroom is no longer as dark at night as it was during the summer. The fall seed pods and assorted “stick-tights” that can almost cover my long-haired dogs after a romp outdoors are gone, too. They were just starting to be a nuisance when the hurricane came through. This year it looks as though I won’t have to deal much with them. 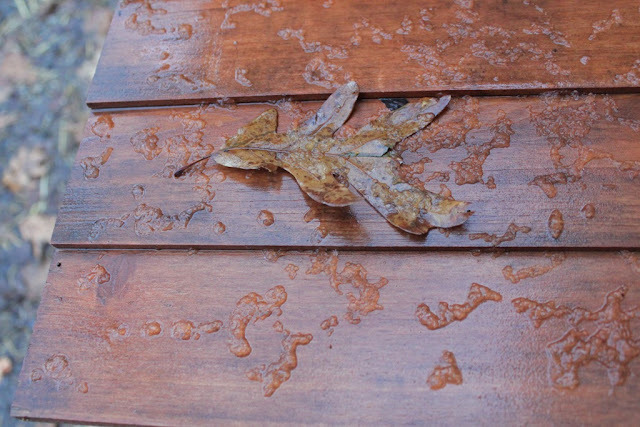 The decks and the gutters will need another full cleaning before winter truly sets in. I cleared everything out the morning before Sandy hit, and now it looks as though I’ve never done them at all. This past week I’ve seen a variety of raccoons, skunks and opossums both around the cabin and elsewhere. The storm might have displaced them, though I think, like me, they are probably and suddenly just in the mode of getting ready for winter. They seem unusually busy and mobile, though. Even the sky is taking on that wintry cast and feel. A breeze from the east brings a damp chill to the air, which already feels chilly enough. Fall has disappeared, winter is almost here, and it feels as though summer ended just last week. I'd better get used to it. This year subtlety is in short supply. My little corner of Roundtop Mtn. feels and looks like late November at the moment . 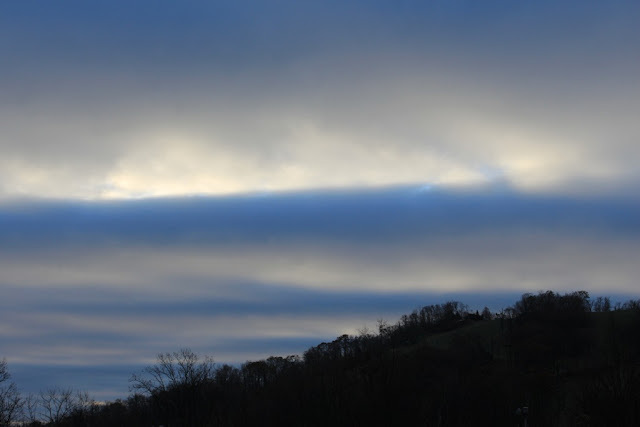 The sky has remained overcast since Hurricane Sandy roared through, and the incessant breeze only adds to the chill. 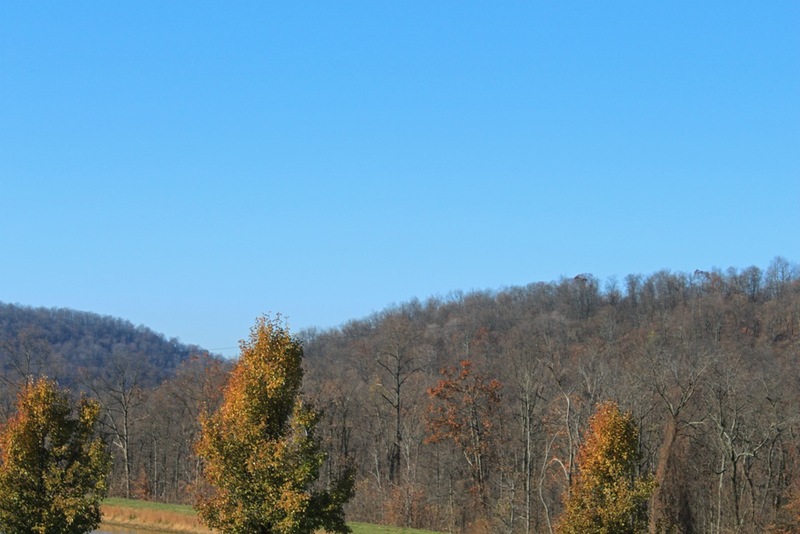 The landscape has taken on that pre-snow, wintry brown appearance. The deer are now the same color as the fallen leaves. And as I am every year, I am surprised again to see just how far I can see now that the underbrush of the forest has withered. The hurricane really sped up the pace of seasonal change in this forest. 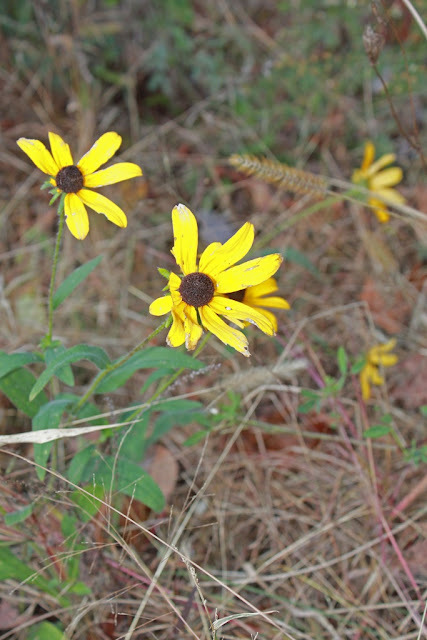 And so it was with more than a little surprise that I found a still-blooming brown-eyed susan this morning as I made my morning inspection of the forest. The flowers are more than a little tattered but weren’t ready to give up just yet. They’ve already survived a mild frost, not to mention the hurricane, though today may well be their last hurrah of the year. With lows predicted in the upper 20’s for tonight, I’ll be surprised if I see the blooms tomorrow morning. Still, I am happy to see blooms of any kind one last time, even if, and perhaps especially if, today is their last. ﻿In all the excitement over Hurricane Sandy, I forgot to mention that juncos have arrived in big numbers. The winter residents are now foraging all over Roundtop Mtn. and have even braved my feeders a time or two. It’s good to see them again. One odd thing about the hurricane is that my feeder birds never went into the kind of feeding frenzy I see ahead of winter storms. Despite producing the lowest barometric pressure ever seen in the lower 48 states, the birds didn’t feed like crazy just ahead of or after the storm. The regular crew was here as they always are, but none of them fed with any greater urgency than usual, at least not to my eye. It was really too dark this dark and dreary morning for a photo, but when I saw a momentary gleam of reddish sunlight touch the tops of the range to my north, I knew I had to try anyway. The reddish color didn’t last very long and within moments everything was gray again. Tomorrow might be the first day this area sees a bit of sun. I think everyone is more than ready for that.